Ref No Grave or Memorial / Rhif cyfeirnod bedd: IV. B. 33. He died of his wounds aged 20 years. The census of the time tells us that David Hughes was born in Denbigh in 1897. 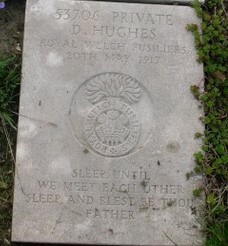 His parents were Elias and Catherine Hughes, he originally from St Asaph, she from Denbigh. In 1901 they were living in the hamlet of Axton near Llanasa. Elias was a lead miner and their family consisted of Martha (6), David (4) and William (1). The family spoke Welsh and English. By 1911 they had moved to Bryn Rodyn, Newmarket (Trelawnyd). The children were listed as David, William, 9 year old Elias and their sister Margaret Catherine aged 6. It looks as though Martha must have died as the census states there were 6 children born to Elias and Catherine but only 5 were living. Boulogne, was one of the three base ports most extensively used by the Commonwealth armies on the Western Front throughout the First World War. It was closed and cleared on the 27 August 1914 when the Allies were forced to fall back ahead of the German advance, but was opened again in October and from that month to the end of the war. Boulogne and Wimereux formed one of the chief hospital areas. Until June 1918, the dead from the hospitals at Boulogne itself were buried in the Cimetiere de L’Est, one of the town cemeteries, the Commonwealth graves forming a long, narrow strip along the right hand edge of the cemetery. This is where David Hughes lies. I have not been able to find any of David’s service records. 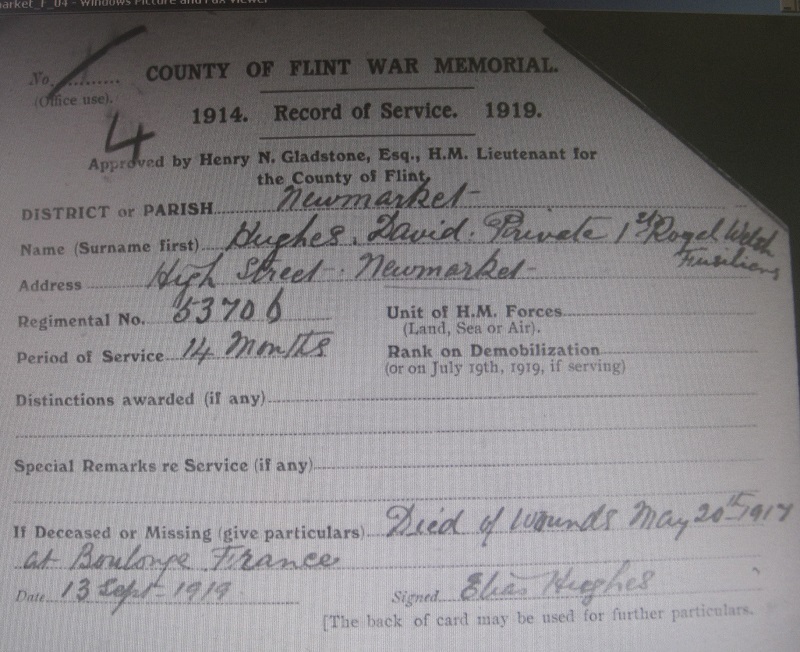 However the Register of Soldier’s Effects shows that in September 1917 his father received David’s outstanding wages of £3/6/6 (three pounds, six shillings and six pence) followed in 1919 by a War Gratuity of £4/-/-. Elias is named as the “sole legatee”. Therefore he must have already lost his wife by 1917. Perhaps she was at least spared from the grief of losing a second child.